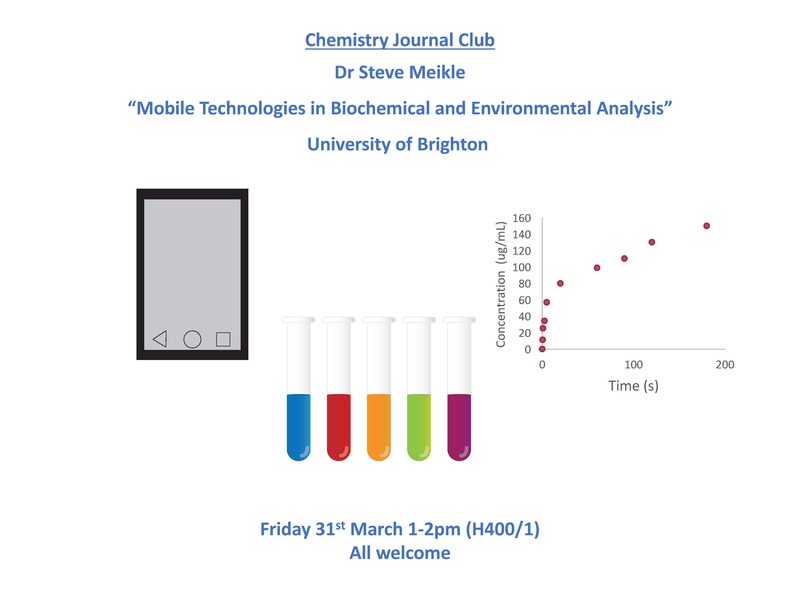 At the Chemistry Journal Club this week Dr Steve Meikle will be discussing “Mobile Technologies in Biochemical and Environmental Analysis“. 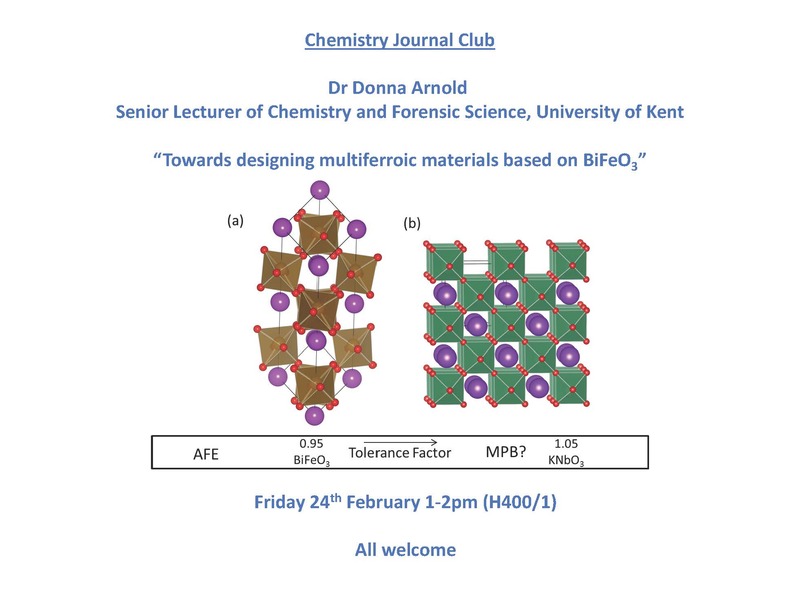 The Chemistry Journal Club will be meeting on Friday from 1-2pm in H400/1, everybody is welcome to attend. Microbial fermentations (eg. those used in biofuel production) are often relatively inefficient. The products of the fermentation are often harmful to the microbes. In the case of ethanol (and other alcohols) this toxicity results from generalised effects on biomolecules and systems rather than specific inhibition of a single process. In this project, the student will test recently advocated hypotheses that propose that the reduction of chaotropic effects in fermentations will reduce energy use and increase the efficiency of the process. 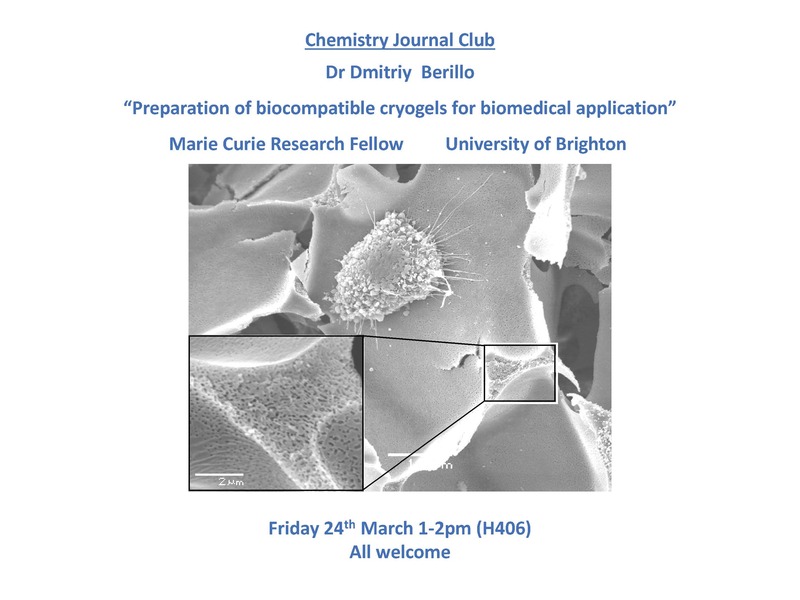 At the Chemistry Journal Club this week we welcome Dr Dmitriy Berillo, Marie Curie Research Fellow at University of Brighton, to present his research entitled “Preparation of biocompatible cryogels for biomedical application”. 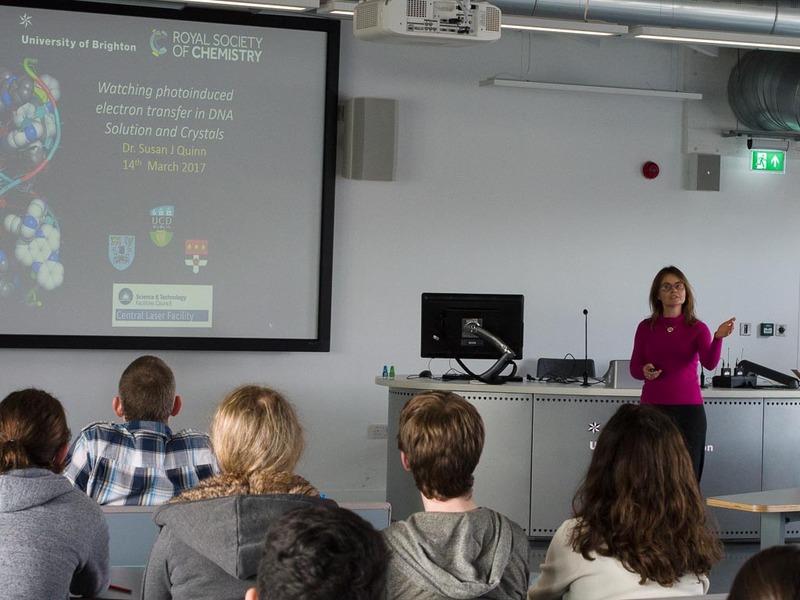 The Chemistry Journal Club will be meeting on Friday from 1-2pm in H406, everybody is welcome to attend. 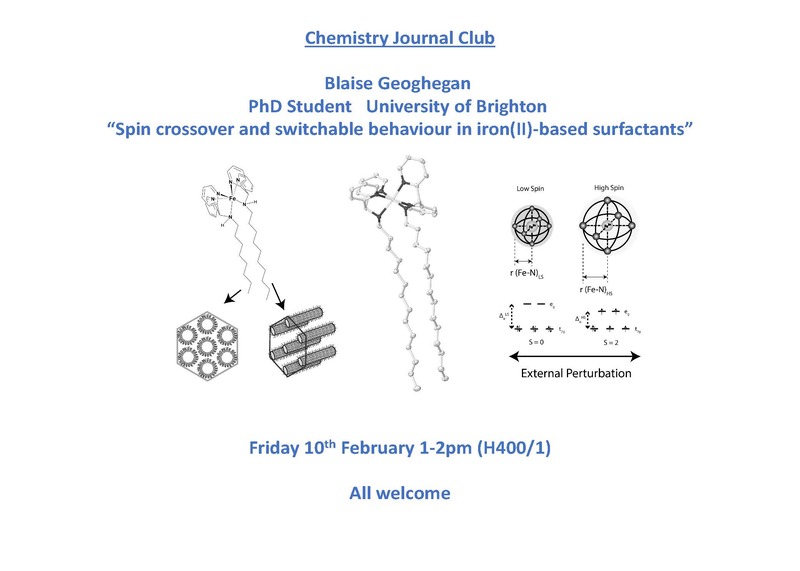 The Chemistry Journal Club will be meeting on Friday 10th March from 1-2pm in H400/1. Look forward to seeing you there. Everybody welcome to attend. The chemistry journal club meets on Friday from 1-2pm in H400/1. Everybody is welcome to attend. The semester two Chemistry Journal Club kicks off with a presentation from PhD student Blaise Geoghegan entitled “Spin crossover and switchable behaviour in iron(II)-based surfactants”. The Chemistry Journal Club will be meeting on Friday at 1-2pm in Huxley Building H400/1. Hope you can join us. Everybody is welcome to attend. 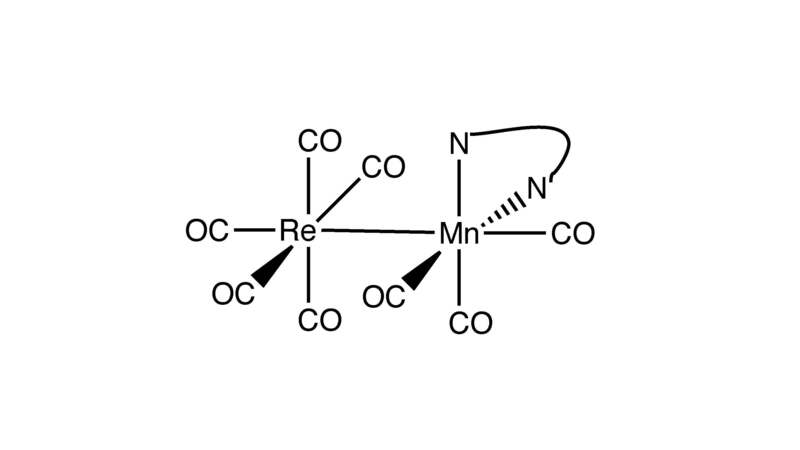 The Chemistry Journal Club will be meeting tomorrow for a slightly longer session from 1-3pm. Presentations will be 15 minutes with 5 minutes of questions. The Journal Club will be meeting in Watts Building W313 at 1pm. Please come along to support the students if you can attend, everybody welcome.